Getting ready for back to school also means getting ready for Back to School Night aka Open House. Back to School Night at my school is for parents only. It is meant to be a time for teachers to introduce themselves, the classroom expectations, and an overview of the upcoming year. Planning a successful Back to School Night can be stressful, so I am excited to share a few of my favorite tips. Send a letter home to parents and/or guardians with the date and time of the Back to School Night. Actually, send home a letter, an email reminder, and post it on your website. Making sure families know the date and time is one of the hardest parts of the whole thing. It may seem like a simple thing, but let's face it, people are busy. Thoughtful reminders can help out even the most organized family. 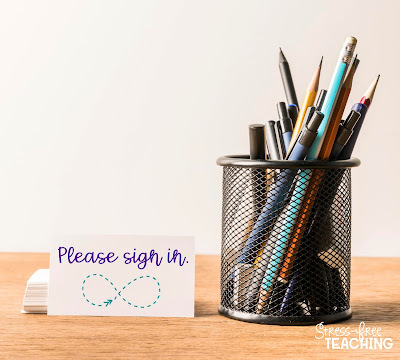 Create a sign-in spot in your classroom. I place a small table by the door in my classroom. I put a container of pens and pencils, copies of handouts, and important forms on the table. As parents enter the room they grab a pen, the handouts, and forms and find a seat. (I use flexible seating, so the students do not have a specific spot.) Parents fill out the forms as everyone is getting settled. The sign-in sheet allows me to make sure that the families that were unable to attend receive the handouts. This tip has been a lifesaver! Create your presentation and then make a video to share with parents that couldn't attend. They will get to hear and see the information you presented. Now, I know what you are thinking, you don't want to video yourself in front of the room talking. Me neither! There's an easier way. I create my presentation and then import it into Google Slides. I use the Screencastify extension in Google Chrome to record my voice going through the presentation. I do this before the actual event. I treat it like a practice run of the actual night. Then, I link the video to my website for the parents to view. You can check out my editable presentation here. Let your parents know how to contact you. 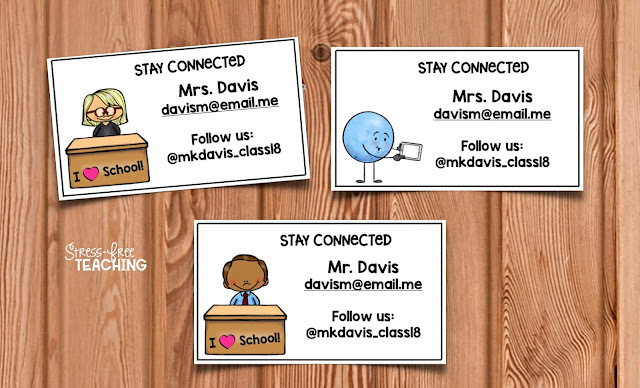 I include this information in my presentation, but also make magnets with the information to give to families. The magnets I use are 2" x 3.5". 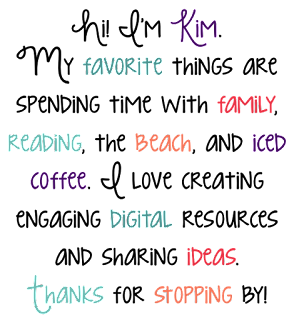 I include my email address, my class website, and the information to follow our class Instagam. Click here if you would like a free template. Fishing for Donations - Use fish shaped cut outs and write one item per fish. Place in a cute fishbowl or glass container. Helping Hands - Use hand shapes and write one item per hand. Classroom Lifesavers - Make colorful lifesaver shapes and write one item per shape. Ask parents and/or guardians to leave a message for students before leaving. They can write about something they liked in the classroom or write a positive message. I place sticky notes and markers near my chart paper stand. Parents write a message and stick it to the chart paper. Remember to write notes to students that didn't have a parent present. My students LOVE reading these messages. 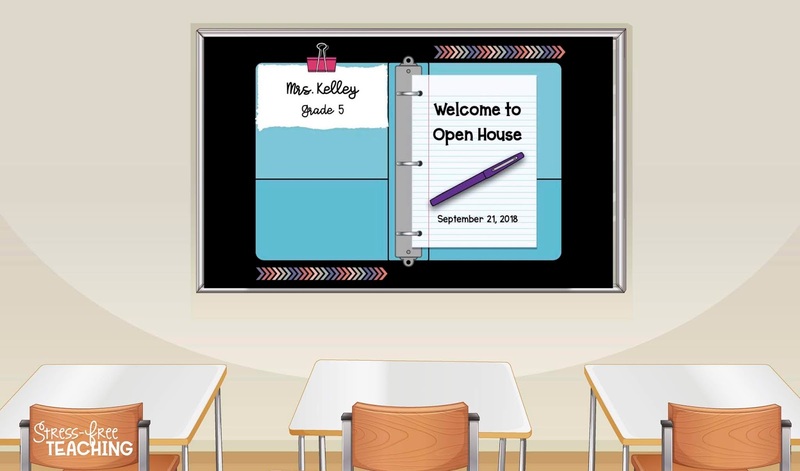 Back to School Night doesn't have to be stressful. I hope you found a tip or two to try out this year. Here's to a fabulous new school year!